NEVER EVER GIVE UP YOUR DREAMS!!! (who knows?you might end up as a billionare ! I will pursue my dream of entrepreneurship and Imagineering. Love that movie! I love Scotland! Hi brandon, you see I have a dream of dancing and my friends think it is super lame. So they left me out of things. 🙁 should I give up my dream. If so, why else should I do? If your friends will desert you because of what you like, and they don’t like it, they don’t sound like real friends. But if you are really set on keeping them as friends, I would try (if they let you back into their ‘circle’ momentarily) to show them some videos of you dancing at a recital (or somewhere, if you feel comfortable doing that) because if they actually see how good you are at dancing, and how dedicated you are to it, they’ll see that this is something you really love. Even if they still don’t accept you, don’t give up your dream! There will always be haters in the world, not everyone enjoys dancing, but you do! Don’t give up just because a couple of people don’t like it. Don’t give up your dream! You’re fri mad just don’t want you to live you dream and follow your heart! If they are leaving you out because of your passion, then they aren’t your friends and don’t deserve you! Never give up on your dreams! Oh yea it will! Keep doing what you love and you can make it to the top! Don’t listen to your friends, who probably aren’t your friends anyways. I did photography it was really fun! I know you should follow your dreams. I want to be a writer and I’ll never give up on trying to be one. I wanna be a author when I grow up but my one friend always says I shouldn’t be an author because she thinks my books would be boring because i’m boring my self! Keep working and you will see that you can be whatever you want! Well… you shouldn’t give up you’re dreams! Everyone thinks I’m that Mean Girl, that Girly Girl, that Queen Bee… but I’ve got good inside! I have the best grades in my class, and I want to be a professional surgeon or go into buisness! Everyone thinks I’m a stuck- up CCP when I’m not! I may be pretty and CCP, but inside, I’m a nice normal person. When I’m older, I wanna be a best-selling author but when I tell everyone they think it’s good but they see me as a big nerd or they don’t believe that I can achieve that name. I want to be an author too! Even if people say ur a nerd, just go for it! Because, whatever u do in life, just be happy! As a fellow author, I suggest that you KEEP GOING with that dream. And why wait until you’re older? You can start now (I have been doing this since I was four)! 3] AND, who are they to tell the future? Are you serious? Tell you “friends” that they can crawl under a rock because they don’t know what you can do! I wanna be an explorer when I’m older and my bf is like ”How would you survive?” When I can do it my own ways! I could be like Steve Irwin!!! Just follow your dorktastic dreams!!!!!! if you really like photography then don’t ‘give up’ for others opinion.Also your young and you don’t even need to worry about this now ! you have so much time to think about your career! I think you should tell your mom that it’s fine if she doesn’t like your dreams, but just because she doesn’t like them doesn’t mean you can’t like them and one day achieve your dreams. You’re mother can’t control you after you grow up. You can be whoever you want because no one can stop you! As for now, don’t let anyone put you down and don’t lie about what you want to become. You can do anything! Just because your friends think its weird doesn’t mean you should quit on your dream but if you relly truly dont want to be a photographer then the choice is yours# insight. Hey picture this,I know your not asking for my advice but here it is:you should be yourself do not let people spoil your dreams i think you should be a photographer because it sounds fun.if you want more advice just ask me! If you actually really want to do photography for a living, I say you should always follow your dreams. But, if photography is only a hobby, you should just stick to being a kid. You’re pretty young, so you probably don’t know what you want to do. 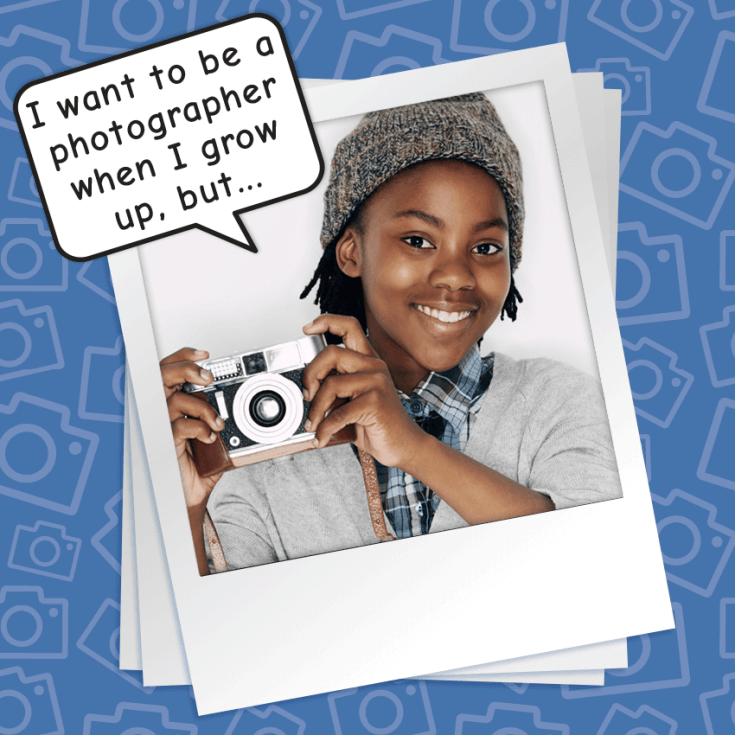 But if you do want to do photography for a long time, you should get started. Tell your parents that you actually want to do something with your life. Anyways, who cares about photgraphy when it’s National Cheeseball Day? Uhhhhh well guess whatI AM NOT REALLY A BIG FAN OF CHEESE AND I WANNA BE A JOURNALIST. You should definitely NOT give up your dreams! You can always make a living out of ANY job! And I think enjoying your work and being happy is important, too. Don’t listen to your Friends, follow your dreams! Maybe go take some photos around your house like if your parents are having a New Years party with friends, take pictures of the decorations. Or maybe download some photo editing apps.